Clearing dampness-heat of liver and gallbladder. Oriental wormwoo,Honeysuckle Flower,Cape Jasminoides Ellis Gardenia jasminoides, Officinal Magnolia Bark,Fourstamen Stephania Root. This product is hard capsule, the content is brown to dark brown powder; bitter taste. For oral use after meals,4-6 capsules twice daily,10 days a treatment course or by medical ordor. Avoid alcohol and tobacco and spicy,cold, greasy food during taking this product. 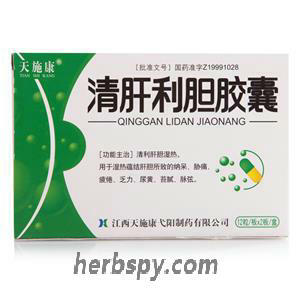 Qing Gan Li Dan Capsule can significantly inhibit the increase of serum GPT, GOT and T-BIL in rats caused by acute liver injury induced by CCl4, so that the albumin content will rise, the globulin content will decrease, and the white/ball ratio will increase, which can alleviate the liver tissue damage caused by CCl4. It can significantly reduce the increase of serum GPT in chronic liver injury caused by CCl4, increase the white/ball ratio, reduce the turbid liver and lipid changes of liver tissue caused by CCl4, promote the bile secretion trend of rats and promote the intracellular system of mice. Phagocytosis. Stage Food and Drug Administration Approval number:Z19991028.